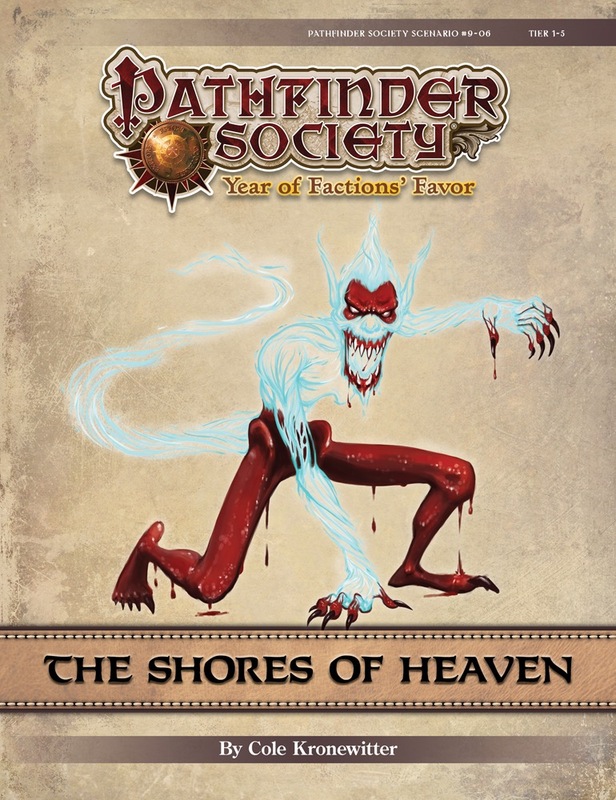 Contents in The Shores of Heaven also contribute directly to the ongoing storyline of the Silver Crusade faction. I'm going to start by being salty: I'm still incredibly annoyed that the sequel to a level 3-7 and a 5-9 is a level 1-5, especially considering the fact that those two scenarios really shaped the identity of my summoner. I even stopped played my summoner so she would be in range for the next part. Sadly that was not to be. While the great John Compton himself came with some reasons as to why this happened, I'm far from impressed by them as it completely ignores the fact that some characters have been invested in Valais and her quest. To make matters worse: this discrepancy in levels is also not the first time Paizo did something like this. I sincerely hope they learn from this. This is not a good way to tell a longer story or treat a story arc. Right, so now that I got that off of my chest, I can now actually review and rate this scenario. 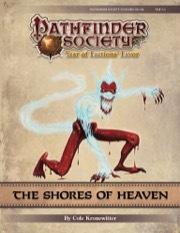 Simply put: we get to go to Heaven, a plane we've never been able to visit before in Pathfinder Society. That alone is a major selling point. The way it also addresses 'evil' PCs is also fitting and not too prominent. Combined with unique NPCs this makes the plane really come alive. The scenario itself has a lot skillchecks and role-playing. The emphasis is thus not on combat and that's exactly the kind of scenario I enjoy the most. There's plenty of opportunity for every character to shine, while also promoting cooperation. I honestly don't have any complains, except for maybe one or two. You see, this scenario introduces a lot of different facets. That's both a good and a bad thing; a true double-edged sword if you will. You get a good impression what Heaven is like, but also does not go into detail. It's like you're being left with just a mere glimpse. I'd have loved a bit more detail, but at the same time it really left me personally wanting to revisit this place again. While it's annoying, frustrating and unfortunate that I had to help Valais with her 'issue' with a different character, I still had a great time and will recommend this scenario to others. However, I will highly advice people to play Traitor's Lodge and Thralls of the Shattered God with a level 5 first and then play this one with that same level 5. It's more enjoyable that way, trust me on that one. Heaven is a roleplay scenario with a heavy amount of skill checks. There is hardly any traditional combat. 1) Continues the storyline of Valais, who is a very likeable and fun NPC. 2) It’s a roleplay scenario. 3) Some really unique encounters, unique places, and an exotic environment, all of which are done well. 4) Unique and interesting NPCs. 1) The pacing of it is very bad. There is a lot of information for the GM to convey at the start and then more roleplay and skill checks afterwards. It starts slow. 2) Although this is a roleplay scenario, it’s the GM that spends most of the time talking. It’s a weird problem to have, but there were too many interesting and weird NPCs who all deserved a little bit of air time, and they all had information to convey. And that time adds up, to the point where the GM is mostly storytelling (so I hope your GM is a good storyteller). Sure it’s fun to talk as Valais, but then there is Kitario, Peligos, Zepha, Akarah, Altha, Skuroth, Ammoch, Oneol, Laktharis, and the Hivetender of Andolleta. It was hard to give them the air time they needed and keep it interesting. I actually had very little time talking with Valais, as I had to move things along. It takes a good GM to pull it off well and a group receptive to roleplay. 3) The skill checks (especially after penalties) seem too high at subtier 4-5. My group (APL 2.5 with a level 5 ringer) failed at subtier 1-2, they had relevant secondary skills (and successfully completed most sections) and would have failed miserably at subtier 4-5. Experience: GM at subtier 1-2 with 5 average PCs. Overall: If you like to roleplay or you’d like to see how the Valais storyline ends, it's a must play (9/10). Played this a couple weeks ago with my LG inquisitor. I totally enjoyed this scenario! I would love to play it again or GM it sometime. There was one strange encounter that took some thought to get thru, but on the whole very fun. The skill checks in this are no joke, and my players got lucky several times where they passed by the skin of their teeth, or that they randomly did have a point in a skill (like a monk who had a point in perform (comedy) because he was based on Jackie Chan). But, there's well written consequences on failing skill checks. As a GM, you should inform the players ahead of time that this scenario is really encouraged for characters who are lawful good, or at least within one step of lawful good. I imagine it'd go a lot worse for a group of all CN fighters. As for the scenario itself, its well written and its clear that the author thought of a lot of the common ways that a group might handle something and then gave guidelines on how a GM should handle it. That's something that a lot of adventure writers could get better at. I'm a pretty new player so this was my first time encountering Valais Durant. My DM had a lot of fun with this and scenario as a whole was great to see the angelic side of the game. The encounters were a lot of fun at 1-5 (high tier) and one of the encounters really let players be creative in fun ways. I will not say what the check is but minor spoilers. Our team had been successful in everything Heaven threw at us and we achieved all goals set out for us till the end skill checks. My character would have only been successful if I got a 20 on the certain check, mainly because of something associated with my character background that made it difficult. The other players who were better off, even had lesser disadvantages than myself would of have had to get 18+ to do this check. The check was the only options for players and no alternatives were offered, so if you weren’t trained in this skill you wouldn’t have been to do this check, even with a natural 20. Each player could only do the check once. They were bonuses, but if someone failed the check anywhere, it reset. Players used rerolls etc but to no avail. From 6 players, only 1 success. The end result left a bad taste in my mouth and the players & DM were a bit down afterwards after such a fun session. I hope the writer of this scenario reads this and think about that for the future because everything else was brilliant. Man, I'm tired. I read that title as "The Shoes of Heaven". I hear they have good souls. HiYO! So happy to see a great NPC returning, and trip to a non-elemental plane. Why so low a tier? Thralls was 5-9, so almost no one in-universe will be familiar with Valais. I'm a tad disappointed. My responses fall into a few categories. 1) To ensure that Pathfinder Society Roleplaying Guild continues to grow and provide new opportunities for beginning and experienced participants to play at the same table, we push to have a considerable number of Tier 1–5 scenarios each season—close to one a month. That means that real estate for higher tier adventures (particulalry 7–11) is pretty tight, and we have very clear goals for those adventures this season. There are enough seconday plot lines that giving each one a high-tier progression isn't readily feasible—not without a serious change to the level ratio that we use now. 2) Should high-level PCs get all of the fun if traveling to other planes? For us, the answer is a resounding no, and this adventure promises to be a really fun one for low-level PCs. Im so g!$~&%n mad this is a 1-5. I have held off for a year to finish this arc with one character at level 9. And Paizo pulls this one AGAIN. Thanks alot guys, thats what I get for investing in an NPC I guess. For point two couldn't some other plane hopping scenario be made for low levels that doesn't involve Valais? I know several people including myself that have PCs that have played both previous scenarios featuring Valais and have anxiously awaiting her return. And now there's a chance to help restore her and we're stuck on the sidelines missing out because we're too high level. This is very disappointing. Is there a chance that someone could let me know what the scenario is where the first demon is destroyed? Like to play/run it first, even if it is out of tier for this one....and yes, I can understand everyone's point of view. Maps for this one? Just learned I'm running this one for a local con a week after it drops. There is one custom map in this scenario. Paizo created an NPC in Valais that was intriguing to players and inspiring to GMs. Interactions between players and Valais performed by a motivated GM elicited fear, confusion, and compassion to depths reserved for few fictional characters. On one occasion where I was running Thralls of the Shattered God at a convention a player jumped to her defense against another player knowing full well the possible reprisals for player-versus-player actions. These players, so invested in the redemption of Valais, wish to see her story completed while playing the same character. Yet Paizo has decided to make this highly unlikely with the level range for the third part of her story. Many will accept this slight, happy to simply see Valais' recuperation reach fruition. But for others it will be akin to seeing some other band of heroes defeat Darth Vader and Emperor Palpatine, or another pair of friends pluck a ring from the bodies of two hobbits and toss it into the nearby volcano. Some may see this as hyperbole; but there are those that chose to believe in an apparent monster and brave a terrible dungeon, then chose to follow her again into a demon-infested land in the hopes that she could be saved. I have no doubt that Season 9 will be filled with thrilling scenarios for players to enjoy. I even believe that the Shores of Heaven will be a wonderful experience. But it will be bittersweet to see "the replacements" go through the adventure instead of the heroes that invested trust into Valais despite her appearance and were rewarded with more than anything that could appear on a chronicle sheet. Pathfinder Society Subscription charged card yesterday - but no scenarios in downloads and still pending order. For instance, today bought Starfinder Subsription and five previous scenarios - all are in downloads immediately! I am just unlucky, or PFS scenarios are not distributed yet? The scenarios released yesterday, though I'm not involved in the distribution side of things such that I would know why you might not have received yours. If you have experienced an issue with payment or delivery, I recommend making a post in the Customer Service board or emailing customer.service@paizo.com. Did I miss a Valais scenario? The product description mentions an incident where the other demon took control. I definitely haven't played any scenarios since we purged the first demon though. Is this just an inciting incident for this scenario that we weren't involved in? I don't know about everyone, but I know that I would be willing to play a reskinning pregen as my character and take a 4-5 cert on a higher level character just to get a chance to enjoy seeing the end of a story arc on the character that has earned that journey. Maybe we can find someway that the players don't feel as if the campaign has kicked those characters to the curb? Another good scenario, yet best re-adapted for a homebrew campaign where the players can fully enjoy the plot with the same characters. Honestly I'm quite supportive of these mini-modules and scenarios they create for the Pathfinder Society, but for the life of me I don't understand why people still subject themselves to the Pathfinder Society ruleset when one can just as easily play these scenarios with friends, on their own time, with their own rules. Because I can do that, and also go play them at PaizoCon, GenCon, and so many other cons without a single hitch. Even better, I can (and have) run games at Space City Con, Comicpalooza, Origins, PaizoCon, and Phoenix Comicon under the exact same rules no matter who shows up and expect them to have characters that are not outside of the established norms. Perhaps I expressed myself poorly; I understand that PFS exists in order to have games at conventions, and there is a reason to have a more streamlined ruleset in place for those occasions. What I don't understand is why, when people like a certain plotline from these scenarios, they don't just play them with their own group at their leisure. Even if one has played the other scenarios with Valais in them in PFS, for example, they can just play this one with their own group. What I mean is, there is no necessity to abide to the Pathfinder Society ruleset in order to play a scenario on your own time amongst friends, and you can utilize whatever character you see fit. It's not like Paizo is watching over your shoulder, or anything. Sometimes we do that. Sometimes we just accept the limitations and play different characters. It helps if you are comfortable thinking about playing a cast of characters rather than a single character through the story. There are too many adventures for just one character to reasonably experience. So you play different characters and experience the overarching story from multiple perspectives. Some of us, Daniel, aren't able to get a time with our friends for a home game. Some people don't have reasonable schedules. I haven't been able to get a game outside of a convention in 4 months, and the only reason I can get those is due to taking vacation and leaving town so I'm not on call. It's not so easy for everyone to 'play this one with their own group' especially if you don't have your 'own group'. And that's the other token. It's not just conventions. It's anywhere. I played in Austin. I played in Columbus. I played in Phoenix. I can play these characters wherever I go, regardless of why I am there. Removed a personally abusive post. Let’s keep criticism constructive, thanks! is the only way for them to get into Heaven and gain the golden apple for everybody in the party to have Knowledge (Religion) trained?? This seems like a surefire way for one fighter or something to ruin an entire party's chance at not being treated like a piece of garbage by the archons from the get-go. is the combat with Laktharis so weak? He can get dropped by a bunch of tier 5s before they even get the message about Intimidation, Perform, etc. I played the halfling well, gave them every hint I could without outright requesting the aforementioned checks--even Akarah chimed in with, "Hey, that wasn't very funny!" and "The kids aren't laughing..." but she never got a third chance to speak thanks to our wizard's burning arc and our ranger's greatsword. does every character have to roll Diplomacy at the end? I get that it's better than one party face removing any need for flexibility from the other characters, but DC 23 from everybody, and only one free miss before they never get to see Valais be reborn as an aasimar? Then our three charismatic characters whiffed, so all that work was for nothing and they were kicked out like mangy dogs. is there so little art?? Neither of Valais's new forms, no puppet Laktharis, no Altha the Scrivener... Paizo, I'll commission your artists for you out-of-pocket if it prevents further missed opportunities. are the locales so underutilized? Granted, the Great Library of Harmonious Scripture can be a neat place if you describe it well enough, but giving the players a rowboat and forcing them to do the same stuff they do in a dungeon, just now it's on another plane and with bookshelves instead of caves, really underwhelmed my group. are the stakes. So. Low. Nothing short of murdering people in the pearly streets will keep this scenario from healing Valais. If the Pathfinders fail their ultimate checks, Kitarlo is forever BANNED from... vacationing in the market district of another plane? Granted, he needs those rituals for his arm, but there are plenty of divine beings who could help him out, and access to the library wasn't a regular thing for him either. The only real tragedy was the somewhat vague and never followed-up-on threat of the entire Society maybe being banned from teleporting to Heaven, a well-explored outer plane, which I'm sure they do not get the chance to do on a regular basis. Man. I expected better of Heaven's Shore.